Confession, my first new car was a Mazda, a puny little GLC with barely enough power to get me up a fair sized hill. I’ve had a soft spot for Mazda ever since. Now comes the 2014 (that’s right, 2014) Mazda6, a car that doesn’t have to apologize for its lack of horsepower, boasting 184 horses from a 2.5-liter direct-injected I4, a couple more than the generously powered Nissan Altima. The Mazda’s power also is superior to that of the top-selling Toyota Camry’s four-cylinder model. Plus, Mazda is using what it calls Skyactiv technology, a blend of direct-injection, variable valve timing, lower weight and higher compression to gain gas mileage while delivering strong low- and mid-range power, the power we all use most in normal daily driving. 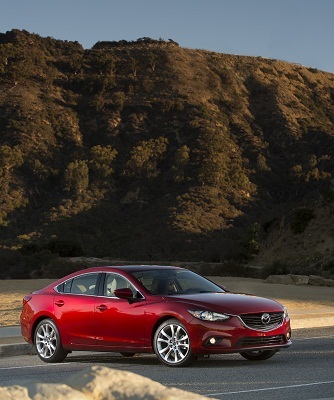 Skyactiv also includes a smooth-shifting 6-speed sport automatic that improves gas mileage up to 7%. So right out of the blocks, the brilliant metallic red ($300 extra, and worth it) Grand Touring test model had technology working to deliver sporty and upbeat performance. But Mazda also scrapped its cartoonish big-mouthed grille along with its cookie cutter exterior to deliver the freshest, most interesting mid-size sedan design in ages. The grille is still big, but is no longer a gaping maw. Plus it’s indented under the hood, like a Mustang (old and new) and some of the sportier cars from the 1970s. The nose’s curb appeal is further enhanced by well chiseled creases atop the front wheel wells and blending into the front doors under the A pillar along with a strong shoulder line back by the C pillar and trunk. Add a slim taillight treatment with a thin touch of chrome at the top and there’s no mistaking this for any other sedan on the highway. Yes, I know the new Fusion has an Aston Martin nose, but this is fresher looking than even that fine-looking family sedan. So here’s the deal. 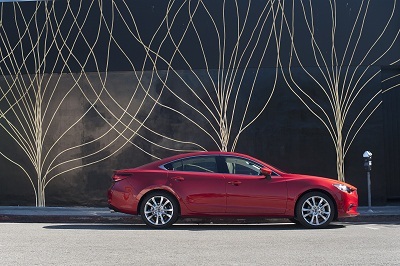 The Mazda6 not only delivers looks and power, but it continues to handle well. Is this a sport sedan? No, but it’s a sporty sedan with good turn-in at corners, and above average feedback via the steering wheel. There’s a nice balance here that many mid-size family cars are still searching for. The car is light too, at 3,275 lbs. for the automatic. So it feels lithe and nimble in turns and under acceleration. I don’t want to oversell the Mazda’s power, because this isn’t a rocket, just very strong. Hauling down a highway entry ramp the six-speed automatic does a slick job getting the car up to speed without big noticeable shifts and it settles into a cruising mode at 65 mph with only minor road noise transmitted to its cockpit. Mazda6 has a clean elegant profile for 2014. With a 111.4-inch wheelbase the Mazda6 delivers a well controlled ride. But this is more tightly sprung than most midsize models. So you can push it more into corners and you’ll notice the firmness of its ride on some crumbling area roads. Ride never turns harsh and underneath are 19-inch Dunlop tires, an upgrade from the 17-inchers that are standard on lower level models.Braking from the four-wheel discs is responsive too and traction and stability control are standard. Gas mileage? You might be surprised. I got 28.7 mpg in about 60% city driving. Pretty impressive for a mid-size car that drinks regular unleaded. The EPA rates this at 26 mpg city and 38 mpg highway. A similar Honda Accord I drove recently was rated 27 mpg city and 36 highway, and delivered 27.4 mpg in a drive nearly identical to this test. Inside, the GT – the top-level Mazda6 – featured a black leather interior with red stitching on the seats and doors. These are well-formed well-contoured seats, adding to the car’s sporty feel, but can feel a little firm on a longer ride. The car’s interior looks pricier than you’d expect, even at this level, with smoked chrome trim on the dash, door handles and by the shifter. A black gloss finish surrounds the central touch screen and there are three easy-to-see gauges in front of the driver, beyond the manual tilt/telescope steering wheel. Overhead a gray roof liner lightens the interior’s look and feel. The Grand Touring model also is loaded with electronics. There’s that somewhat small touch screen, which houses the TomTom navigation and radio screens, plus a backup camera that displays on the screen, and a blind-spot warning system that lights up an alert in the exterior rearview mirrors. Inside four adults fit easily and comfortably, and I found that even after I powered back my driver’s seat there was good leg and foot room for rear passengers. Headroom is a little more limited in back than in front and beyond the seats is a family-sized 15 cubic foot trunk. Roomy! Note that there are power front seats with a variety of adjustments, including a power lumbar support for the driver. The GT model also comes with three-level heated front seats and I like the large buttons on the steering wheel hub that make it easy to adjust the radio, cruise and trip computer without taking your eyes off the road. One small complaint, the leather wrapping the steering wheel is pretty slick. I found it best to take off my winter gloves while driving. That small nav/radio screen makes adjusting it, slightly harder than I’d prefer, but the buttons around the screen are easy to see and understand, and the three climate control knobs are simple to use. Overhead is a sunroof and a HomeLink system on the rearview mirror. Mazda’s visors also have extenders to block side sun. 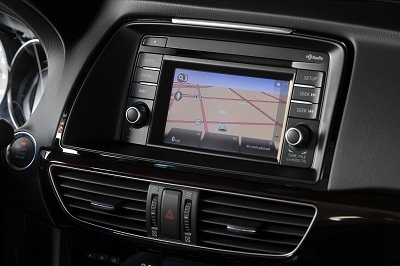 The navigation and radio screen is small with tiny on screen buttons and little volume and tuning knobs. Price is in the plus column too. The base i Sport with six-speed manual transmission starts at $20,880, with the automatic 6-speed model starting at $22,495. There are several trim levels available, with the Grand Touring topping the lineup at $29,495. With a $795 delivery fee and options this one hit $31,490. That’s nearly exactly the average price of a new car today.The Mazda6 is a fine mid-size car that should give the big boys a run for their money, except that they already have a huge lead in sales. Hard to knock off the front runners, but give Mazda high marks for trying. Hits: Sharp looking styling outside and inside. Good handling, solid power, controlled yet sporty ride and room for four adults. Easy dash controls, three-level seat heat, big buttons on steering wheel hub, back-up camera, blind-spot warning, big trunk and good gas mileage. Misses: Small navigation screen, slick leather steering wheel and seats are a bit too firm, but supportive.